Spend a day or two exploring this Area of Outstanding of Natural Beauty with beautiful flora and fauna, unique beaches and coves and fishing villages. Take time out to enjoy a slower pace, listen to the skylarks in summer and watch the clouds pass by. The Lizard Peninsular is unique in Cornwall as the geology will reveal. Around 20 miles of the area is made up of the green, red and white veined Serpentine rock. With the same protection status as national parks, the Lizard is an Area of Outstanding Natural Beauty due to its diverse and wild nature. 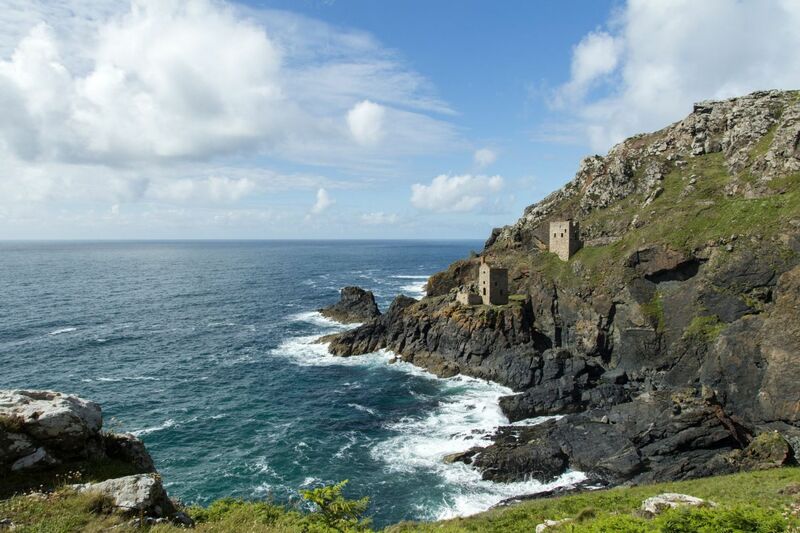 Visit The Lizard National Nature Reserve (including Kynance Cove, Lizard Point and National Trust coastal area) and look out for the Cornish Cough, Britain’s rarest breeding bird and Cornwall’s national bird, basking sharks, dolphins, Clouded yellow butterflies and coconut-scented gorse. Walk away from the cafe across the beach and take a cliff path up to take in the views of both Poldhu and Church Cove (Gunwalloe). Church Cove was featured in both Poldark series with its lovely sandy beach and tiny church of St Wynwallow. Both beaches are sandy and popular with families. Follow the South West Coast path towards Kynance Cove, or if you fancy a shorter stroll, park at Kynance Cove National Trust Car Park and take the path down to the beach. This is truly spectacular coastline. Turquoise waters, steep cliffs and rocky outlets will lead you to the beautiful Kynance cove. Spend the day on the beach or continue exploring around the area on foot. The cafe at the bottom offers a welcome respite on warm days or a great place to cosy up for a hot chocolate when the weather is less kind. Park in the car park above the village and walk down to the village. The path to the village leads you out of the forested area to view the fishing boats, thatched cottages and tiny fishing cove with cliffs on both sides. Walk up the hill to view from above and enjoy a drink at Cadgwith Inn. If you take a right up the coast path you can take a look at the Devil’s Frying Pan. With your feet in the sand you can enjoy light bites, great coffee or an ice-cream on Poldhu Beach. Enjoy beautiful views from the terrace over the sea from this historic pub. In the winter, cosy up by the fire. The pub as an award-winning reputation for the freshest local and seasonal food, our daily changing menus offer something for everyone. Most of Porthleven Holiday Cottages holiday homes are dog friendly. Just about every pub and eatery on the Lizard will welcome your dog including all three pubs in Porthleven, the Top House In, Cadgwith Cove Inn and the Ship Inn in Mawgan-in-Meneage.